The Bayit Yehudi is still waiting for clarifications from the Likud regarding its coalition agreement with Livni’s party, says MK Uri Ariel. The Bayit Yehudi party is still waiting for clarifications from the Likud regarding its coalition agreement with MK Tzipi Livni’s Hatnua party, MK Uri Ariel said on Sunday. The coalition agreement between the Likud Beytenu and Hatnua stipulates that Livni will be appointed Justice Minister and will also be in charge of handling the negotiations with the Palestinian Authority, with a final decision on any peace agreements to be made by a ministerial committee headed by Prime Minister Binyamin Netanyahu. The Bayit Yehudi has indicated that this agreement is unacceptable in its view since, when Livni conducted negotiations under former Prime Minister Ehud Olmert it was reported that the two had agreed to give up part of Jerusalem to the PA.
Livni rejected the allegations at the time, but former U.S. Secretary of State Condoleezza Rice has revealed in her memoir that Olmert offered Abbas 94% of Judea and Samaria, as well as shared control over Jerusalem. Abbas rejected the offer. Speaking to Arutz Sheva Sunday evening, MK Ariel who heads the Bayit Yehudi’s coalition negotiation team, said his party had asked the Likud for clarifications regarding Livni’s role and was still awaiting for the Likud to come back with an official response. Ariel said that during a condolence call at the home of the Rabbi Menachem Froman z"l of Tekoa last week, he met Livni and had a brief conversation with her, during which she asked him why his party was objecting to the role she has been given. 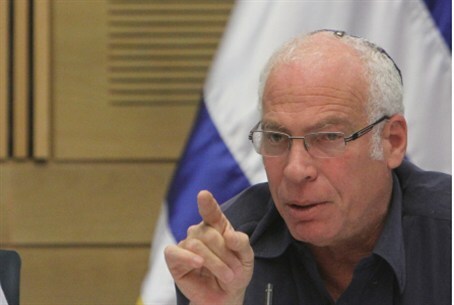 Ariel said he had explained to Livni the nature of his party’s objections to her conducting peace negotiations. Ariel said he believes Netanyahu is able to make changes to the agreement with Livni, but the question remains to be seen whether he wants to do so or not. Netanyahu held a three-way meeting with Yesh Atid chairman Yair Lapid and Bayit Yehudi head Naftali Bennett on Sunday night, as the politicians attempted to forge a deal that will make it possible to present the new government Wednesday. Negotiating teams for Likud / Yisrael Beytenu and Bayit Yehudi met in Ramat Gan Sunday afternoon, but talks reached a dead end after a short time. The main sticking point is still the wording of the agreement as regards hareidi enlistment to the military. Sources in Likud / Yisrael Beytenu said that Yesh Atid had taken back its agreement to matters that had already been finalized. "In the morning, we reached an agreed outline for equality in [military] service with Yesh Atid, and we reached an agreed formulation, but in the afternoon they went back on everything that had been agreed upon regarding the outline." After the conclusion of the three-way meeting, which was also attended by Yisrael Beytenu chairman MK Avigdor Lieberman, the parties' negotiation teams continued the talks into the night.